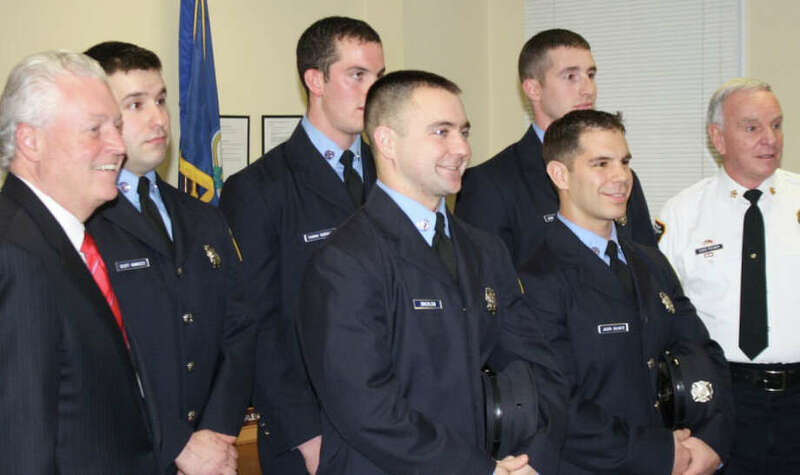 Five new Fairfield firefighters were sworn in at Thursday's meeting of the Fire Commission. The meeting also included recognition for Anthony Jannotta, stepping down from the commission after a decade-long service as both a member and chairman. The new firefighters -- Jordan Charney, Scott Iannucci, Thomas Keneally, Jason Salvato and Francis Zwierlein III -- were sworn in by Town Clerk Betsy Browne as First Selectman Michael Tetreau, Fire Chief Richard Felner, commission members, fellow firefighters, and family and friends looked on during a ceremony in Sullivan-Independence Hall. As he was recoognized for his service, Jannotta -- counsel to Gov. Dannel Malloy and known locally as founder of a family-organized charity food drive each year -- thanked Felner and the commission members for his opportunity to serve.